As I was putting my coat on and leaving work today, I left the office door gaping open because I couldn’t be bothered. Suddenly, a figure materialised in the door frame Star Trek transporter style. I first thought it would be the cleaner, however, I know the cleaner and it neither looked nor acted like her. The eerie figure on the doorstep was female and dressed as though she had arrived on bike. Considering the freezing temperatures, I considered that unlikely. She was wearing a curious combination of sports boots, biking leggings and fishnet shirt. By the way of greeting, she said she just popped in to see if our colleague Jimmy was in. Well, he was out, I replied the obvious. She proceeded to inquire how I was doing with my teaching. Because the rule of the thumb at workplace is to never tell the truth, I retorted I was doing excellent, while still coping to place her. Among the obvious options, after the cleaner was excluded, was a travelling saleswoman of bike wear, a tricky Jehovah’s Witness or a trade union leader (probably because of the fishnet top, which I associate with someone keen on hooking and catching unsuspecting victims). After several minutes of a painful conversation (all conversation is painful when I have to participate in it), it transpired that she was the department head. I did see her once before (I’m temping, hence I can’t be reasonably expected to know my boss) but she clearly didn’t leave a lasting impression on me. It could be because she spoke Slovak (and I can’t be reasonably expected to understand Slovak thirteen years after the split of Czechoslovakia). I’m glad I didn’t point out to her that the bin needs to be taken out. If I had, she would have had her questionable attire to blame. Why do I bother wearing smart casual for work when the department head wears a biking fisherwoman style? For her own good, I hope she was in disguise for some undercover operation that I’m unaware of. Other than that, I can’t think of a sensible excuse why wear that for work. 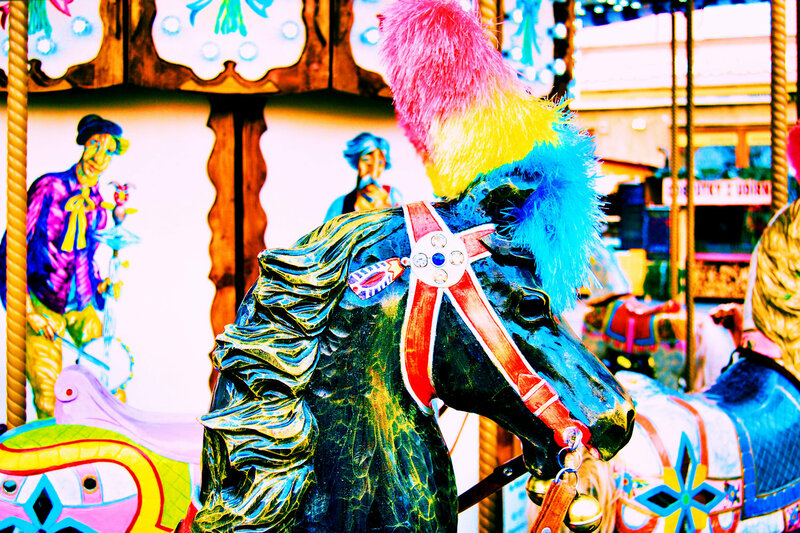 Maybe next time I see her, she’ll be wearing a cleaning duster in lieu of a hat, like the carousel horse in my picture. Perhaps she was trying to make a fashion statement 😀 …question is “what”. Hm, did you say you work in a bank? Has no one shot you yet when you had your hood on? I found I can only get some respect from people when I dress smart. I lack the fierce looks that would gain me natural respect. Wow, that’s a n intriguing outfit for anyone to wear ! University does strange things to people – best be cautious ! I am cautious as much I can be, no worries! I’m never going to wear biking clothes for work because I don’t have any (and I don’t have a bike). Neither do I have anything fishnet. So I should be safe! I’m glad you promised entertainment Mara for your post reminded me of my teaching days though I have to say I did at all times know my head of department, at least by sight if not in any intimate way. I take it you don’t work in one of those ‘progressive’ places where students call you by your first name? I didn’t either but the longer I worked in my last school the more ‘names’ I acquired. I was always a Mr but the kids I worked with a lot did have a range of variations on my last name which were all I am sure signs of affection. Our cleaners like yours were lovely people whom one got to know well over the years and who would do anything for you if you asked politely, which of course I always did. Most enjoyable read I have to say…..
Did I promise entertainment? I must have been drunk. The department head was the one who hired me, so I did meet her, but it was only one time and at the time she was wearing what one would reasonable expect a department head to wear. Her change of fashion confused me. Given the different traditions in my country, we never address people at workplace by their first names – it is inappropriate and rude. It is only in English-speaking environments that first names can be used. I call my students their first names and I encourage them to reciprocate, but they don’t because they can’t bridge the gap between their mother tongue and English as yet. The cleaners are the best, aren’t they? Most cleaners I’ve met were so cheerful, outgoing and friendly – I wouldn’t expect that, given the harshness of their jobs. Maybe the word promise was wishful thinking or its how I read your posts……it could just be a context thing…. I think traditions are good, though they can get in the way at times. I’ve always maintained they call me what they feel comfortable with. Good cleaners are worth their weight in gold. It’s still difficult for me even in an English-speaking professional environment to call senior colleagues by their first names (which is pretty much the standard, in my experience). I usually go for Professor XY and the like, and I sound odd. I never worked in a University only high schools so the protocol for names was always first names among staff even the principal. The first school I ever went to as a practice teacher I called the Deputy Principal Sir and received a right Royal bollicking over it…..it was pointed out that only students called him sir teachers called him Les. Hahaha 😀 That’s a lovely story! In my culture it’s considered near-offence for a junior academic to address a senior one other than with “professor” or other title, as applicable. It’s of course up to you to find out what the title of the person is. I knew of a school principal who had a PhD and who insisted n being called Dr…..to though to me she was always Sharon.